This allows one to construct a transition state model as follows. Two iPrOH molecules are displaced by diethyl tartrate for each half of the Ti2(OiPr)8, with the two metals then becoming bridged by one oxygen from each tartrate. Two further iPrOH are then displaced from the second Ti by one of the substrate (allyl alcohol) and one of the oxidant (t-butyl peroxide). The oxygen transfer now proceeds via the second (hexacoordinate) Ti. The first Ti also achieves hexa-coordination via the carbonyl oxygen of one of the tartrate ester groups. It is the geometric properties of such a hexa-coordinated Ti that in part accounts for the subtle properties of this system. Put more simply, the extra crowding at the catalytic centre of the binuclear complex restricts the space available for the transition state, making it more selective for producing one enantiomer of the epoxide. 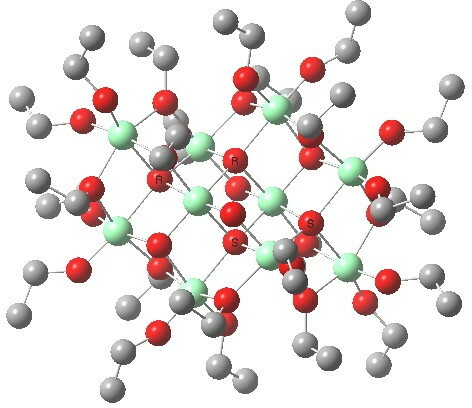 The (ωB97XD/6-311G(d,p)/SCRF=dichloromethane) optimised geometries are shown below. 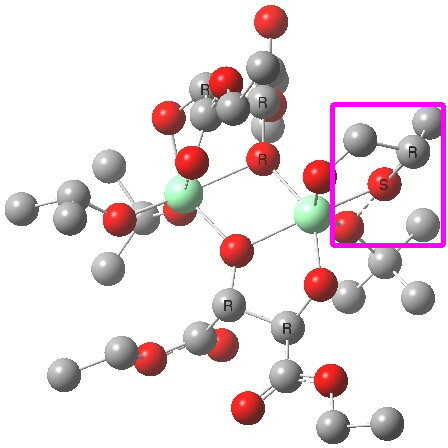 The reaction centre is shown in a magenta box for the disfavoured (R) epoxide and in green for the favoured (S) epoxide (the hydrogens are not shown for clarity; if you want to see them, click on the image to get the 3D model). You can see immediately that the biggest differences between the two occur in the bottom right corner. The t-butyl-O-O group folds in for (S) and this has a knock on effect on the two ester groups of the bottom right tartrate (the disposition of the tartrate on the top left is hardly changed). 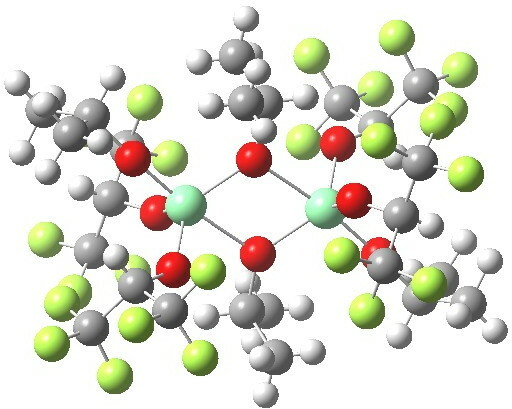 This folding is mediated by the hexa-coordination of the catalytic metal centre, together with dispersion interactions occurring to the t-butyl group, and this is helped by buttressing from the second Ti centre and its substituents. The free energy difference ΔΔG298‡ favours the (S) for over the (R) by 3.0 kcal/mol. This free energy difference corresponds to an enantiomeric excess of >99%. 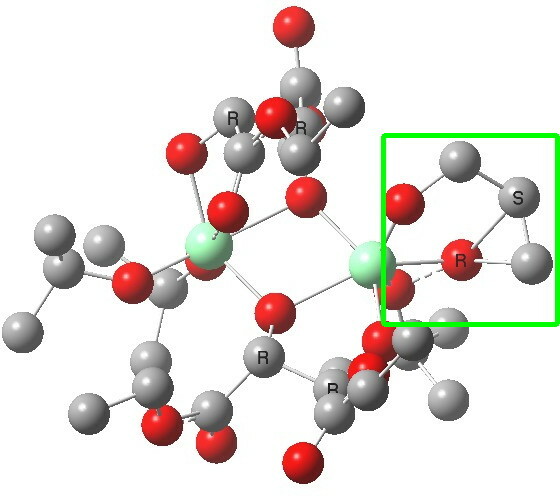 In terms of attractive dispersion forces alone, (S) is favoured over (R) by -2.6 kcal/mol, and hence attractive dispersion seems to be the dominant term distinguishing between the two diastereomeric transition states. This aspect of non-covalent-interactions will be investigated in another post. KOGYEK, a Ti oligomer. Click for 3D. One should however finally ask if this is the best model? Not all conformations have been explored in these models, although (S) was built from (R) as a template, so many features are the same. Nevertheless, further conformational exploration may be useful. Alkoxytitaniums are known to also form higher oligomers, such as the one shown above.. If their concentration is significant, these too might be catalysing the reaction. Only computation would establish if they are capable of greater stereoselectivity/faster kinetics. So we could end up with an answer that a number of oligomeric transition states are involved. But the one presented here, if not necessarily the most accurate or “best” model, seems good enough to form a template for further exploratory computation to see if the enantioselectivity of the reaction might be improved upon further. This entry was posted on Monday, December 17th, 2012 at 5:39 pm and is filed under Interesting chemistry. You can follow any responses to this entry through the RSS 2.0 feed. You can leave a response, or trackback from your own site. Why the Sharpless epoxidation is enantioselective! is licensed by Henry Rzepa under a Creative Commons Attribution-Noncommercial-Share Alike 3.0 United States License.